These three units run simultaneously throughout the 4th and 5th Grade Chorus rehearsals. 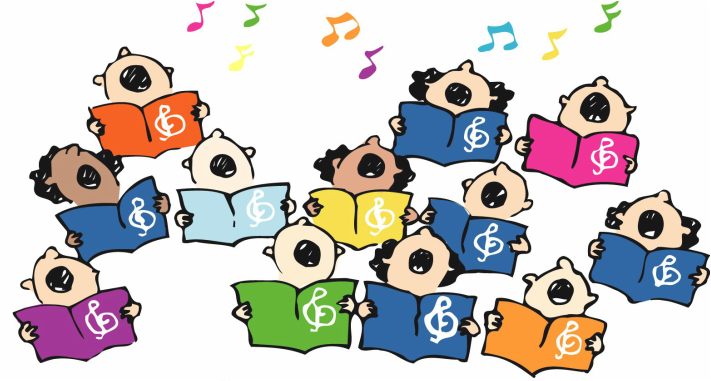 In 4th grade, we touch on the basics of singing in a chorus: singing with a healthy vocal technique, keeping simple harmonies, and learning to listen and match the people around you. In 5th grade, we delve deeper into more difficult harmonies, using common vowel shape, score reading, and phrasing together as a chorus. How can I use my vocal instrument to create music? How can I produce the best sound I can? Everyone has a head voice and a chest voice. The amount of air we use and the relaxed utilization of our vocal chords determines the quality of sound that comes out. Our intercostal muscles control our air intake and output. It is important not to push your voice, and listen to your body for signs of overuse and/or improper use. Stand in a posture that allows them to breathe properly and sing properly; each vertebrae will be stacked on top of each other to ensure the student can take in a full, relaxed breath and sing without straining. Take in a full, relaxed breath during warm-ups and during singing. Sing in a chest and head voice. Why do we use music in chorus? How can I tell what the music will sound like? Written music allows everyone in the ensemble to follow along. Chorus octavos show us the elements of music. Chorus music can be written in one line or multiple lines on top of each other. Follow along with a choral octavo. Read musical elements on the page such as dynamics, tempo, pitch, rhythm, articulation, and musical form (coda, da capo, etc.). Sight read simple melodies using solfeg. How does a group of people work together to make music? What is my job in a choral ensemble? Chorus is a team sport: every voice counts. In order to make music as a unit, we must listen to each other. The conductor keeps the ensemble together and gives direction on how the music should sound. Blend with their classmates using common vowel shapes and phrasing. Sing in harmony with their classmates. Contribute positively to music making.